By Taxi: Taking a cab from the airport will cost about $50.00. You should tell the driver to take you to Concord Ave. via Harvard Square in Cambridge. Once on Concord Ave., driving away from Harvard Sq., you will cross over Huron St. and soon after, you will see a school playground on your left and Fern St. on your right. (If you get to a rotary, you have gone too far.) Turn right onto Fern St. Then left onto Bay State Rd. We are just past the park on the right. The ride can take anywhere from 20 to 50 minutes depending on traffic. By Public Transportation: Public Transportation from the airport to the AAVSO can be a little challenging, however it is much cheaper than taking a cab. While still inside the airport, purchase a fare card. There should be kiosks to do this in the baggage claim area. The current fare prices for the subway are here and for the buses are here. Then walk outside bagagge claim and look for the bus stop for the Silver Line route SL1. The Silver Line route SL1 (Logan Airport - South Station via Waterfront) bus rapid transit service, provides direct connection to and from Boston Logan Airport and South Station (Servicing the Commuter Rail, Greyhound, Amtrak and Peter Pan Bus Lines) on the MBTA Red Line via the Waterfront. The Silver Line Airport schedule is here. Take this silver line bus until the last stop which drops you off at South Station which is a stop on the RED line of the "T". Follow the signs to the OUTBOUND Red line train. The final destination of the train will be "Alewife" and the train will pass through Harvard Square. Take this train and get off at the Harvard Square T stop. Once at Harvard Sq. follow signs to the bus lines. You will need to take either the 74, 75, or the 78 bus to get to the AAVSO. Take either bus and ask to be let off at the National Guard Armory stop, which is approximately 7 minutes from the Harvard Square station. You will be let off at the corner of Birch Street and Concord Avenue. Walk down Birch Street, then left onto Bay State Rd. We are on the right. This whole process usually takes about an hour. 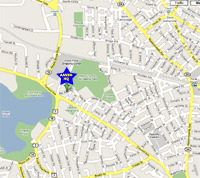 By Car: To get to AAVSO HQ by car, take Route 128 (also called Route 95) to Route 2 East (Arlington, Belmont, Boston). Do not take Route 2A. Drive on Route 2 East until you begin to see stores and restaurants (approximately 5 miles). Keep to the right once the highway ends and continue over the bridge. On the right, you will see a large glass/metal structure, which is the "Alewife" subway station. You are now on the Alewife Brook Parkway. Continue on this road until you reach the first rotary. There should be shopping centers on both sides of the road. Imagine the rotary as a clock. You will enter the rotary at "6 o'clock", and leave the rotary at "11 o'clock". You will then, almost immediately, see another rotary. You will enter this rotary at "5 o'clock" and leave it at '12 o'clock' (right by the Sozio's appliance store). You will now be on New Street. Immediately bear right to stay on Bay State Rd. We are about 100 yds down on the left. By Subway (The "T"): The closest subway station to the AAVSO is the Alewife station, at the northern end of the Red Line. From Alewife station, walk out to the Alewife Brook Parkway, and walk on the left hand side of the Parkway, where there is a small walkway (large apartment buildings should be on your left side). Cross over the bridge, and continue on the Parkway, passing a shopping center on your left. Follow the road as it curves to the left, passing a gas station and a Dunkin Donuts store. Cross the street with the rotary at your right, turn left so the Sozio's appliance store is on your right. Stay to the right, this is Bay State Rd. We are down on the left. By Bus: Three buses, route 74, 75, or the 78 , stop near the AAVSO. Take one of those buses from the Harvard Square subway stop (on the Red Line). 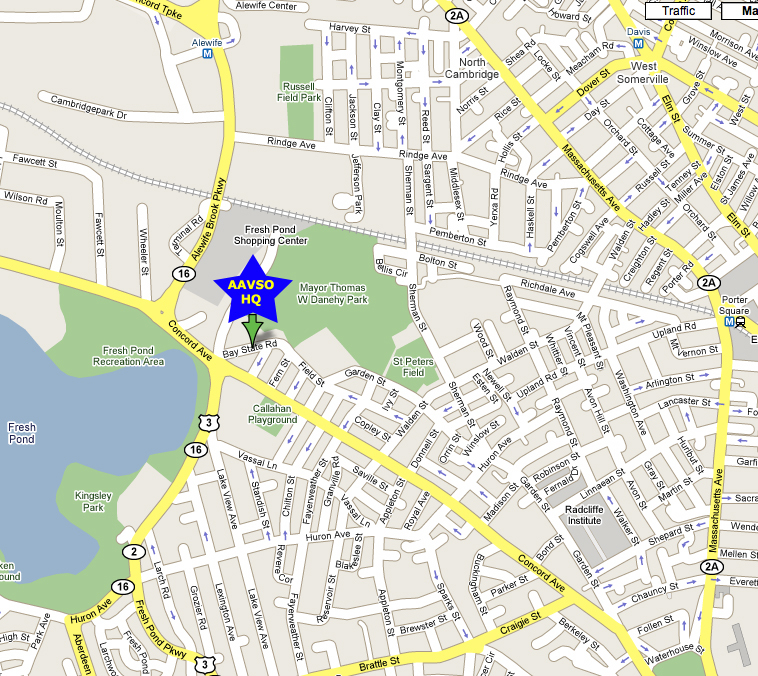 Ask to be let off at the National Guard Armory stop, which is approximately 7 minutes from the Harvard Square station. You will be let off at the corner of Birch Street and Concord Avenue. Walk all the way down Birch Street then left onto Bay State Rd. We are on the right.